Eyetracking: practice what you preach? Am I the only one to find this ironic? Marketing Pilgrim brings good content most of the time and they’re in my RSS reader for quite a while. But when I opened one of their last posts on eyetracking in my browser, I couldn’t help wondering how serious they take their own content. 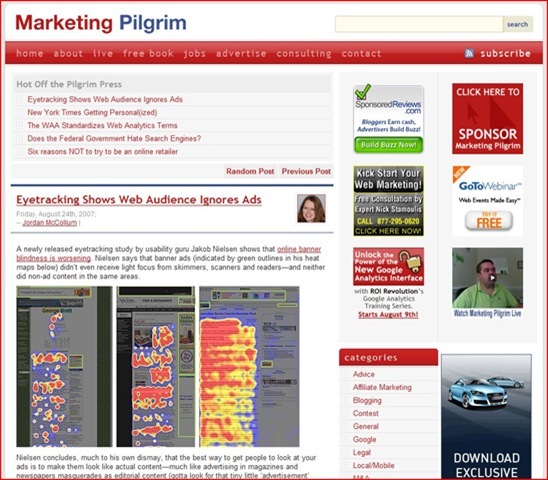 The eyetracking study they talk about shows clear results (and so did other eyetracking studies in the past) about banner advertising on websites, but look at Marketing Pilgrim’s own sidebar. One third of the screen filled with ugly banner ads… that nobody looks at. Why tell other people smoking is dangerous when you’re a smoker yourself? I’d like to think we’re one step ahead of most sites that run advertising. We offer our advertisers shout-out each month – a real contextual blog post. And we also feature some of them in our RSS feed. We also encourage our advertisers to change their ad creative regularly, so that readers are not so blind to them ads. Still, enough people will click on the ads and there’s also the brand building aspect too. Please email me if you have any suggestions for improvement, I’d love to hear from you. About the banner ads themselves, I do believe that they generate results (working for MSN I see these results as well) and changing the creative regularly is needed indeed to keep these results. Still, I wondered what you learned from the post about the eyetracking yourself and if that would have you change something on the site. Also, if the ads work, why didn’t you add that information /opinion to the post as a counter argument? Now I don’t want to be picky or anything, but that was what I was thinking when I looked at the post.